Matador Nights editor Kristin Conard figures out what to do with her extra cash in this swank district of New York City. 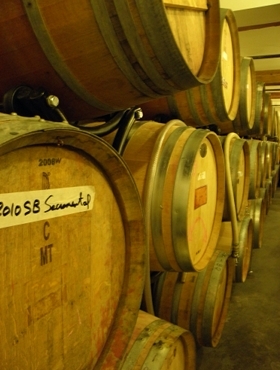 City Winery is the only winery within Manhattan, and like beer comes straight from the keg, you can get wine here straight from a barrel in the basement. The house wine on tap costs around $10, depending on the vintage, and there’s both red and white. Ask the bartender for a recommendation if you’re not sure what to order. Mariebelle Sweets specializes in artisan chocolates, truffles, ganache: I delight in just saying the names, much less eating them. I lived in England, so I know the value of a good cup of tea, but in the Tea Salon at Mariebelle I bypass it for the thick, slightly spicy Aztec hot chocolate. It’s made not from the powder — the residue of the bean — but from the actual cocoa bean. The menu at Quattro Gastronomia Italiana is seasonal. One of the seasons is truffle season. I had no idea that was a thing, but apparently during November and December the menu features truffles on pasta and meat dishes. The pasta is made fresh, and if your meal there is anything like mine you’ll want to rub the chocolate mousse all over your face (but won’t), and will silently thank the waiter for not making fun of your obvious shock at the realization that tartare does in fact mean raw. The fixed price menu is $42 per person and includes an appetizer, main course, and a dessert. My favorite part about Boqueria is that you can, if seats are available, watch the chefs at work while you dine. It makes me feel like I’m on Top Chef. Since it’s tapas, you can get one of everything, or keep it focused. My recommendation for that focus is the bacon-wrapped dates. The small Japanese restaurant Omen is in a rowhouse, and the food is Kyoto-style. The restaurant is technically a chain with 4 restaurants; 3 are in Japan. The restaurant doesn’t serve sushi, and the focus of the food is on quality and artful arrangement as opposed to portion size. For a variety of tastes, the fixed price menu for $80 lets you sample seasonal appetizers, main courses, and desserts. I find that tromping around NYC can leave me with sore feet, and every once in a while it’s fun to indulge in a foot massage or pedicure at a spa. If you want to go for a full-body scrub, the Spa at Trump, opened in 2010, has the city’s only luxury hammam. 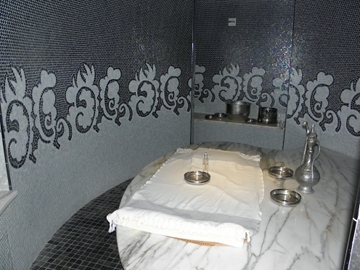 I tried the Turkish hammam — it took about an hour and cost $100. I lay on a heated marble stone, got scrubbed down, and at the end was buried beneath a mound of soap bubbles. I emerged with hair mussed, my face flushed, and a dazed but blissful smile. Not a pretty sight, but I felt good. Other spa options in SoHo include Bliss, where the men’s locker room has beer in buckets and white wine is served during manicures and pedicures. Act like you belong there. 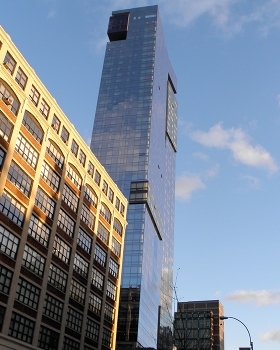 That was my brother’s advice to me as I stood outside the 44 floors of shiny glass and chrome that is the Trump SoHo, and I pass it on to you. Ask at the desk if there’s anyway to upgrade your room to a higher floor — easier to do during the week than on the weekend. Anything above floor 21 will get you views out over Manhattan. And if you stay during the summer, the rooftop pool on floor 7 opens up. During my stay, I called from the phone next to the bed (rather than from the one in the bathroom) and asked if I could order a pillow from the pillow menu. “OK, we’ll bring those right up.” I gave the phone a little hug before I hung it up. A room is really just a place to keep your stuff and sleep, sure, but I could see myself quickly getting used to the personal touches. I rolled over onto the calm pillow as I fell asleep, saving the revitalize for the morning. If you don’t want to stay, but still want a touch of the Trump experience, there’s the mezzanine level library, which overlooks the second floor lobby. It’s got free wi-fi, you can order snacks and drinks, and there’s a selection of Taschen books available.